For those of you still uncertain as to whether CrossFit will help you attain your body composition goals, here’s a remarkable story from our very own Josh Acosta. Interestingly enough, it all started because of a bet between father and son. Fortunately for us, our bodies don’t care about how the decision to be healthy starts, so long as that decision gets made. The bet? $500 to the first person to get below 200 lbs. Talk about motivation! If you couldn’t already tell by the picture above, Josh won. He’s now $500 richer and the proud owner of a brand new lease on life. How did he do it you ask? It’s simple really, and it has always been simple. Josh just decided to be committed. Consistent exercise, via CrossFit, and strict Paleo-Zone eating habits. 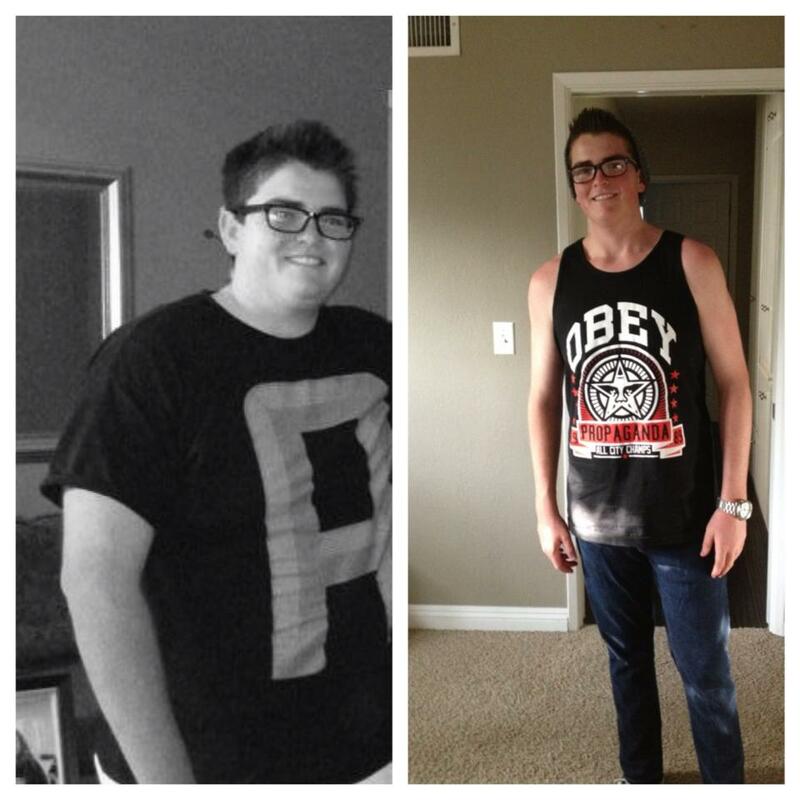 In 4 months he dropped from a very hefty 263 lbs to an incredible 187 lbs. For the mathematically challenged, that’s 76 lbs lost! * Some of you might be thinking, “he was probably doing nothing but going to the gym 24/7 though.” Nope. Josh stuck to his 3 days a week, every week. The key is consistency, and now he’s reaping the benefits. Oh yeah, and excuses never seemed to get in the way. For those of you who don’t know Josh, his left shoulder is highly prone to dislocation. I’ve even witnessed it pop out a few times in the gym myself (it’s not pretty). Regularly we have to scale/modify his workouts to work around the injury, but that hasn’t kept him from pushing hard on the regular. He’s also been super busy finishing up his senior year of high school. It’s cut into his gym time a bit, but he’s more than made up for his lack of exercise with continued strict Paleo-Zone eating habits. Let this be a lesson to everyone: if, for whatever reason, you can’t make it to the gym for an extended period of time, stay true to your eating habits and good things will continue to happen. Not only did Josh win the bet, but he’s also winning at life. How will you get motivated?